Angular contact bearings are single row ball bearings but designed in such a way that the central line of the contact between balls and race ways is at an angle. This angle is called a contact angle and as per the manufactured design these vary between 15o, 25o,45o In this type of bearings contact angles between balls and tracks have been swung to an angle between 20o to 40o to the radial plane. These bearings are capable of carrying higher axial loads than the corresponding deep groove ball bearings, but in one direction only. These bearings are eminently suitable where heavy thrust loads are encountered at high speeds. 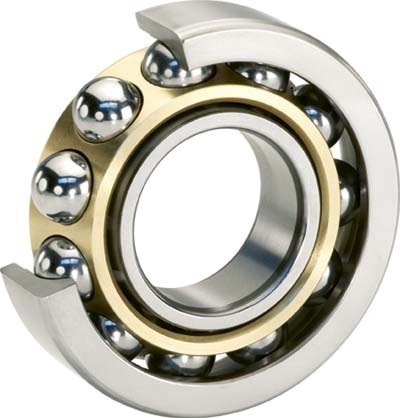 Usually these bearings are mounted in pairs and adjusted axially against each other so that they may support combination of heavy radial and thrust loads.